Use up ripe bananas in these fluffy and chocolately muffins which contain coconut oil, not butter, and maple syrup instead of sugar. 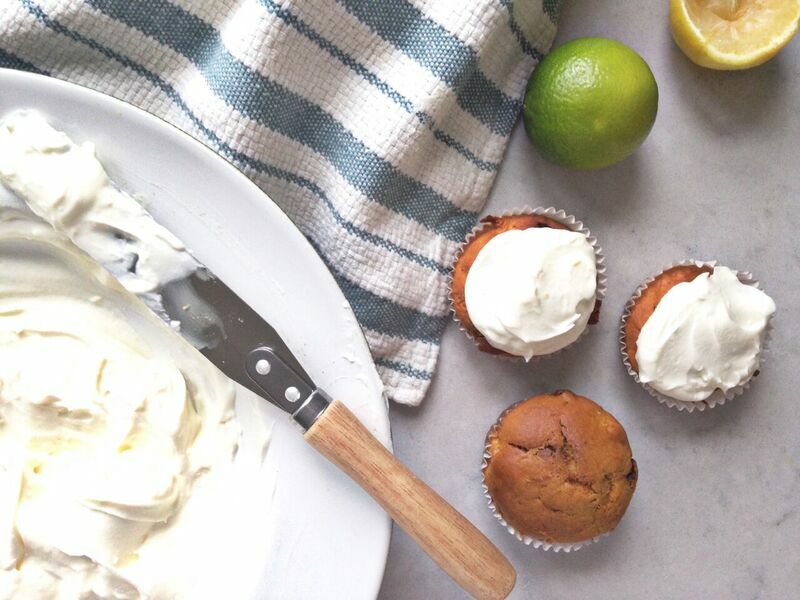 You can whizz the whole mix up in a food processor, including mashing the bananas, meaning the muffins can be cooking away in the oven in minutes. 1. Preheat the oven to 180°C/350°F/Gas mark 4 and grease and line a muffin tin with nine cases. 2. Get the kids to peel the bananas, break them up and pop them in a food processor. Pulse briefly to mash them. 3. Sift the flour, baking powder and bicarbonate of soda into a mixing bowl then add to the bananas in the processor bowl. 4. Add vanilla and maple syrup to the bowl, crack in the egg and measure in the coconut oil. Whizz the mixture to combine. 5. Remove the blade and stir in the chocolate chips with a metal spoon. 6. Divide the mix between the muffin cases, then bake in the preheated oven for 30 minutes. Allow to cool in the tin for 10 minutes, then eat warm while the chocolate is still melted or cool on a wire rack and pack in a lunch box. Keep in a tin - best eaten within two days or you can freeze them and defrost for lunchboxes or the school run, as needed. I came up with these as alternative chocolate treats for Easter bunny season, but because they contain lots of carrot (rabbit food) you can make them and call them bunny bars all year round. As well as making them a little bit healthier than your average brownie, the carrot and orange zest keeps these chocolately bars really nice and gooey. They're made with maple syrup (or agave nectar) in place of sugar, plus coconut oil in place of butter. Kids don't taste any of the carrot, orange or coconut - just chocolate. 1. Preheat the oven to 180°C/350°F/Gas mark 4. Grease and line a 20cm(approx) brownie tin. Fill and boil the kettle. 2. Help the kids to zest the orange using a fine box grater. Peel the carrot and grate it straight into the box grater too alongside the orange zest. 3. Set a pan on a medium heat and fill with your boiling water. Get the kids to break the chocolate up (this is easiest to do with their hands whilst it's still in the foil wrapping) then pop it in a heatproof bowl and set it over the boiling water to melt. 4. Get the kids to measure out and sift the flour and cocoa together into a large mixing bowl. 5. Measure out the maple syrup (or agave nectar) and coconut oil and put directly into the bowl of your food processor. Crack in the eggs. 6. Add the melted chocolate, orange zest and carrot to the processor bowl and blend everything briefly to combine. 7. Use a palette knife to scrape the mixture into the bowl with the sifted flour and cocoa, then fold together with a wooden spoon. Kids find this easiest if you pop a folded tea towel under the mixing bowl to stop it from spinning. 8. Pour into your prepared tin and bake for 25 minutes. Leave to cool for 10 minutes in the tin then cut into nine bars and cool on a wire rack. 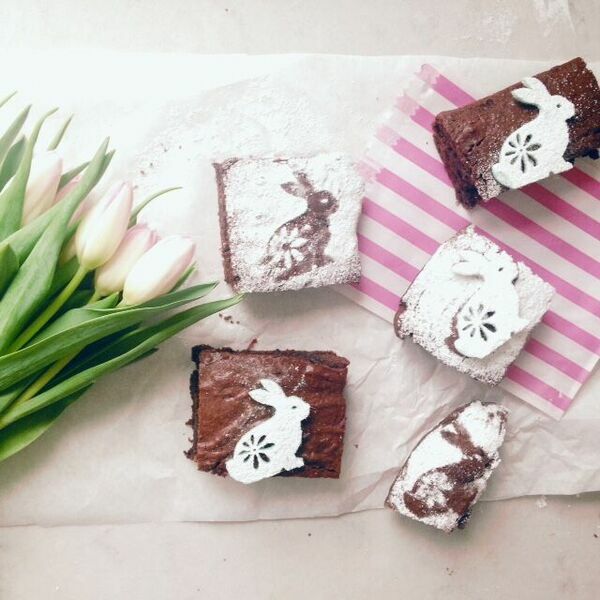 You can dust with icing sugar and use a little bunny template to decorate if you like (ours was a felt bunny from an Easter craft set but you could use any shape or leave the icing sugar off altogether). You can make these simple gingernut biscuits using any cutters your kids fancy - we like using our dinosaur shape which is actually meant for cutting up sandwiches, but does the job for us. The dough is made using coconut oil, not butter, maple syrup in place of golden syrup, and a spoonful of ground almonds for added nutritional kick. 1. Preheat the oven to 190°C/375°F/Gas mark 5 and grease a large baking sheet. 2. Sift the flour, bicarbonate of soda and ginger in a large bowl. Stir in the ground almonds. 3. Melt the coconut oil and maple syrup together in a pan over a gentle heat then pour into the flour mix. Stir to form a soft dough. 4. Roll out to about the depth of a £1 coin on a lightly floured surface. 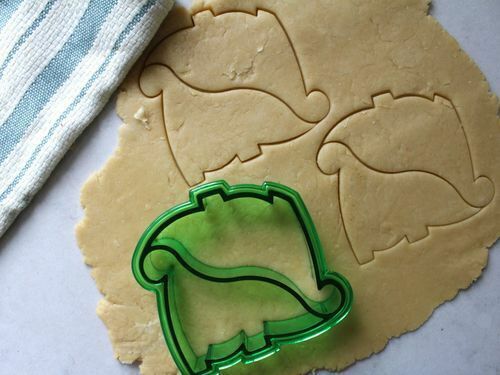 Get the kids to stamp out dinosaurs and transfer to your prepared baking sheet. They can use a chopstick or skewer to make little eyes in the dough. 5. Bake for 10-12 minutes until brown. Cool for 5 minutes on the baking sheet then transfer to a wire rack to cool completely. Store in an airtight tin for 2-3 days. The food processor takes all the strain when making these simple cakes - grate the carrots in yours in seconds, then switch blades and finish the cake batter in there too. In place of butter, sunflower or vegetable oil, we use coconut oil; in place of sugar, maple syrup. They are light, fluffy and just sweet enough - not overly so. If you want to make them gluten-free, switch the self-raising flour and baking powder for gluten-free varieties. These freeze well so make a batch and bag them up once cool so that you can always get one or two out to defrost ahead of the afternoon school pick-up. Also good for lunchboxes. 1. 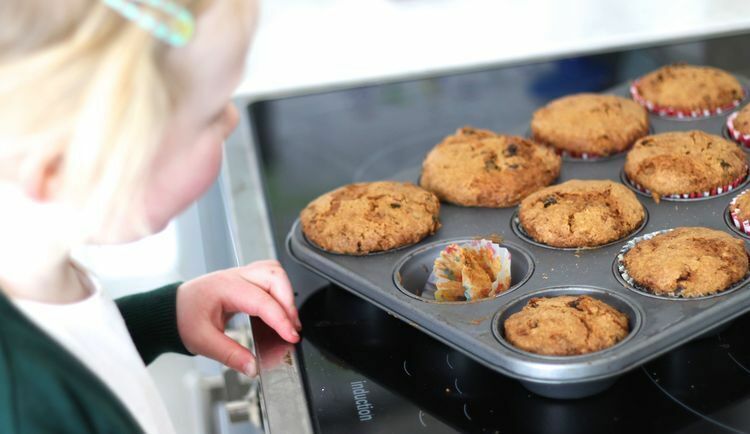 Preheat the oven to 160°C/325°F/Gas mark 3 and line a deep muffin tin with cupcake cases. Top and tail and peel your carrots, then use the grater attachment on your food processor to grate them in five seconds flat. Switch to the standard blade and decant the carrots into a large mixing bowl. 2. Now the get the kids to help you measure out the coconut oil and maple syrup directly into the processor bowl. Crack in the eggs and whizz just to combine. 3. Add the self-raising flour, baking powder, cinnamon and nutmeg and whizz again briefly to form a batter. 4. Pour into the mixing bowl with the carrots, throw in the sultanas and stir it all up with a wooden spoon. Kids will find this easiest if you place a tea towel under the mixing bowl to prevent it from spinning. 5. Spoon the mix into your cupcake cases and bake for 35-40 minutes or until a metal skewer inserted into the middle comes out clean. Cool on a wire rack. Will keep for a few days in an airtight tin or you can freeze in bags and get them out in batches when you want them. Made with mascarpone and a dollop of yoghurt, this frosting replaces icing sugar with maple syrup or honey to cut down on refined sugar. For a citrus kick, use limes, lemons or orange. Try using it to ice our easy-mix carrot cakes. 1. Empty the mascarpone into a large mixing bowl and use the back of a wooden spoon to break it down until smooth. 2. Get the kids to help you zest your chosen fruit, then cut it up and juice it. Box graters work well for zesting and hand-held juicers make light work of the job for little hands. 3. Stir in the zest and juice of your chosen fruit, then add the maple syrup and honey and stir again. Finally, add 1-2 tbsp yoghurt - you want to get to a nice spreadable consistency but not too runny and this will depend on the amount of juice you got out of your fruit. Check out last week's recipes for easy homemade versions of kids' favourites, including chicken nuggets and meatballs. Next week, Emily brings us speedy standby meals for when time is tight. Fancy trying any of these recipes? We'd love to get your feedback and see your photos! Post them to our Twitter or Facebook pages.